One would think that everyone, whether you’re a regular working staff or a higher executive, deserves the most comfortable office chairs. However, you will be surprised that many individuals, including employers, take this for granted. Truth be told, in order to encourage your staff to work harder and be happy with their job to increase productivity, you have to make sure that the office is a work conducive environment. This includes providing a comfortable office chair. 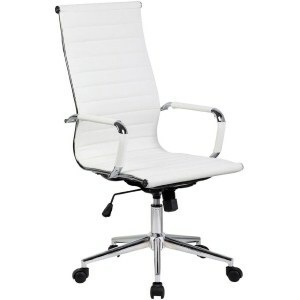 So whether you’re looking for an office chair for yourself, or chairs for your staff, take comfort into consideration. Why Do You Need a Comfortable Office Chair? In an article from inc.com called “10 Tips for Making Employees Love Their Office”, comfort comes next to keeping the office organized. They stressed on the fact that a comfortable office environment is not only about the aesthetics, rather the design should be able to boost the happiness of the employees. Take note that while a good chair and a sturdy desk are important, there are other factors to take into consideration too such as lighting, ventilation, temperature control, etc. Office chairs can be found in various parts of an office and even at home. It can be found in the workstation or desk of each employee including executives. There should be office chairs in meeting rooms. You can even have one or a few in your home office. Even if you don’t hold office at home, if you find yourself working on after-work jobs or bringing home unfinished work at the end of the day, a comfortable office chair is ideal. Office chairs can also be used by your children or teens who study at home or on their computer. Furthermore, while there are chairs created specifically for gamers, there are plenty of gamers who opt for comfortable office chairs too. Imagine working for long hours sitting on a plastic stool. Even if it has an armrest and backrest, you will most likely end up feeling tired even after a short while with your back and bottom aching from fatigue. An office chair is commonly ergonomically designed to provide support where needed to keep you comfy for long hours. Manufacturers of these chairs take into consideration those who will use it — people who are most likely working on their desk for at least 8 hours every day getting up only for lunch and coffee breaks. An office chair is usually durable and long lasting. Take for instance your dining chairs at home. These may seem sturdy and might even last for decades in your household. Some of us even inherit our family’s dining sets and they still look and feel great even after a long time. However, even your dining chairs might get damaged sooner than later if you use these for countless hours as you work every single day. These are designed for about a couple of hours’ use per day as you eat your meals, not necessarily for all the hours you need while working. If you had to get up each time you have to reach a stapler or an extra piece of bond paper every single day, then it can get quite inconvenient. While moving around while working is good for your blood circulation and your health, there are times when standing up just to push your seat aside to reach out to something quite near but beyond your reach while sitting down can take a lot of your precious time — especially when you’re rushing with that deadline your boss has been bugging you about. Office chairs usually have wheels that can keep you moving freely within your work area without having to stand up. This might seem like a small thing for some, but for others, this means a whole lot. Especially when you’re working from home, a comfortable office chair will give you that “professional feeling”. It feels just like you’re in the office. When you’re in the office, having a comfortable chair makes you feel like an important person doing an important job so you have to stay convenient and comfortable. Try to take notice how some offices have different office chairs for regular staff and managers. The staff has the usual task chair or mid-back office chair while the managers get those ultra-comfortable expensive-looking executive chairs. Whether you notice it or not, there’s that feeling of importance and professionalism related to these office chairs. Comfortable office chairs look great in an office area. Again, imagine your home office with a plastic stool. While it’s acceptable and the overall design of your office may be what matters, try to imagine that again, this time with a very comfortable-looking high-back leather executive chair. It is way better, right? These chairs may seem irrelevant to some, but the overall look of an office can change with great-looking office chairs. A low-back office chair, commonly known as a task chair, can easily be differentiated from others simply because it has a lower backrest. The backrest can usually automatically adjusts or flexes forward or backward while sitting without the need for any mechanism. While it offers enough lumbar or lower back support, it doesn’t offer any support at all to the upper back, head or the neck. A mid-back office chair is designed to offer support to the mid-area of your back. However, most of these also offer lumbar support and enough support to the shoulder blade area. 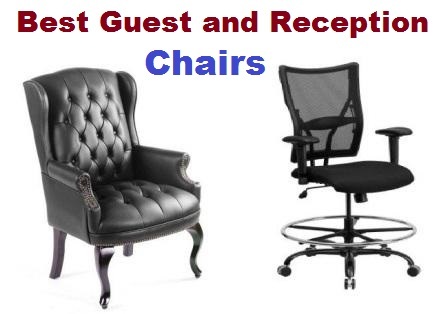 If you’re on a tight budget but you wish to get as much support and luxury as what executive or high-back chairs can offer, mid-back chairs are better options compared to task chairs. More often than not, high-back or executive chairs are pricier compared to the first two types of office chairs. These are usually adjustable in most areas from its height to its backrest and sometimes even the armrests can be customizable. In most cases, high back chairs do not offer only lumbar support but also mid-back and upper back support. It even offers support for your neck and head if you wish to relax after working for hours non-stop. 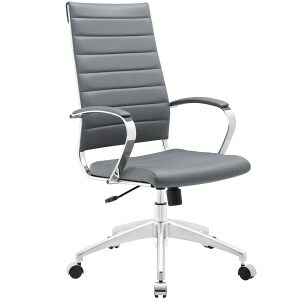 Leather/Leatherette – Leather is a top choice especially for executive chairs. These are common sights in offices, especially those of managers and other executive positions. Some office chairs are made of leatherette, while some are made of real leather. Of course, genuine leather is pricier. This is a popular choice because leather doesn’t only look classy and elegant; this material is highly durable too. Various Types of Fabric – There are numerous types of fabric used to upholster office chairs. These range from mesh to vinyl to linen and so much more. You can choose from natural fabrics and synthetic fabrics, depending on your preference. Here are a few things that you should take a note of when choosing an ideal office chair. If you’re looking for something comfortable and one that you can use for endless working hours, then these essentials are definitely must-haves. Backrest – The backrest can be easily classified as the common types of office chairs – low, mid or high. While there are office chairs without any backrests, if you need one that’s meant for use for several hours per day, this part is truly essential as it offers support, convenience and comfort. Armrest – There are office chairs without an armrest, some have permanent armrests and others have adjustable armrests. Wheels/Casters – More often than not, office chairs feature five legs and five casters/wheels. There’s really no solid explanation about this except that five wheels offer more stability and balance, not to mention easy mobility such as a 360-degree swivel. As much as possible, these wheels should work on multiple surfaces such as carpeted office floors. 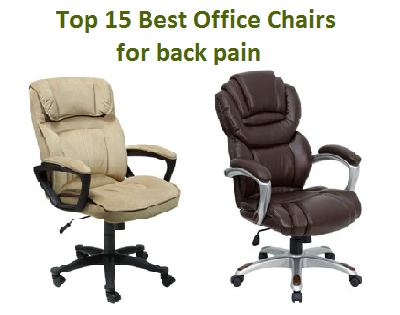 Lumbar Support – To avoid backaches and tension, and for a bit of relaxation as you work, an office chair that offers lumbar support is essential. We specifically mentioned this, as lumbar support is present in most office chairs from task chairs to executive chairs. Having an office chair that offers upper back support is just a bonus. Flexibility – An office chair usually has a tilt tension control knob. This keeps your office chair stable or flexible. Loosen the knob and you can feel the base and the back of your chair adjusting to your movements. Tighten it and it stays as is even with your movements. Pneumatic – Pneumatic is defined as “containing or operated by air or gas under pressure”. Most office chairs available in the market today are pneumatic rather than mechanical. You will spot a handle underneath the base of the seat, which you can simply pull up to adjust the height of your office chair. 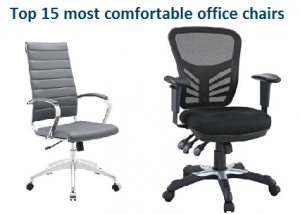 Because there are literally thousands of office chairs available in the market today, it’s hard to say which one is good and which one is not. Sometimes, people think that price equates to quality. And while that is a common case, it is not necessarily true all the time. But of course, you can’t really compare an office chair that costs less than $50 to one that is $500, right? Nevertheless, you might find bargains here and there and who knows, you might just find the best office chair on an incredible sale. It is best for you to know what to look for you so that you know you’re getting the best value for your money. Comfort – It isn’t called a comfortable office chair if it doesn’t offer enough comfort, right? Comfort comprises of the support the chair can offer such as lumbar support, mid-back support, upper back support, or even support for the head and the neck. Durability – Durability is highly important because office chairs are more often than not, pricey. You don’t want to be wasting your money on a chair that won’t even last over several months. Ideally, an office chair should be working great over a few years. Furthermore, especially if you’re letting your staff, employees or clients and guests sit on these chairs, you have to make sure they’re durable and safe. Some office chairs even have maximum weight capacity indications. Overall Look and Design – While aesthetics is not as important as the above qualities, it is still something that’s good to have. On this part, check on the design of the office chair such as the materials used, colors available, and its overall physical appearance. Pros and Cons – Consider yourself lucky if you find an office chair that’s 100% perfect, zero flaws and simply amazing. It is probably safe to assume that more often than not, office chairs, no matter how perfect they seem, may have a flaw here or there. The important thing is that its advantages outweigh the disadvantages. 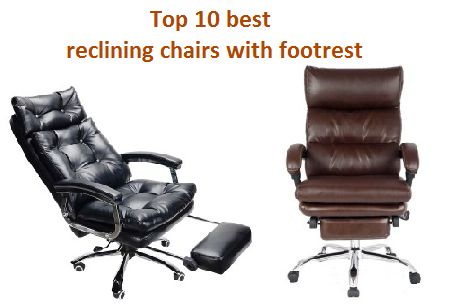 Now to come up with top 15 most comfortable office chairs, we took into consideration some of the best-selling office chairs of today, as well as a few not-so-famous products yet across the various categories and types of office chairs. Of course, comfort is the first and foremost factor we considered, as well as durability, overall look and design and how much the pros have outweighed the cons. Most importantly, we took into consideration the comments, ratings and reviews of actual owners so we can accurately rank the most comfortable office chairs. The top priority when it comes to choosing the most comfortable office chairs in the market today is of course, comfort. Most of us can’t wait to go home after a long day’s work so we can relax and grab a bag of chips as we watch TV while sitting on our La-Z-Boy. Thankfully, La-Z-Boy brought their signature comfort to the office by creating their own line of office chairs. Most of us are already aware by now about the durability and great reputation of the La-Z-Boy brand. We must say that the La-Z-Boy 45776 Cantania Executive Bonded Leather Office Chair is one of the close-to-perfect and most comfortable chairs you will find in the market. The La-Z-Boy 45776 Cantania Executive Bonded Leather Office Chair comes features an advanced layering system called the ComfortCore Plus with Memory Foam. This offers the right amount of firmness but plush cushioning so that you can feel supported and comfortable at the same time. Furthermore, the La-Z-Boy 45776 Cantania Executive Bonded Leather Office Chair features a Wellness by Design Flexible AIR Lumbar Technology that adjusts around the lumbar area for improved posture and added back support. The padded headrest, armrests and layered body pillows add to the overall comfort of the chair too. The La-Z-Boy 45776 Cantania Executive Bonded Leather Office Chair is made by one of the most reputable manufacturers so you can expect high quality materials and workmanship with every product. This office chair comes with a 10-year limited warranty as well so you can rest assured that manufacturer defects can be addressed with less worry on your end. The La-Z-Boy 45776 Cantania Executive Bonded Leather Office Chair, just like the previous La-Z-Boy chair we ranked on this list has passed BIFMA testing standards and can support up to 250 lbs. of weight. The La-Z-Boy 45776 Cantania Executive Bonded Leather Office Chair is available in coffee brown. Its timeless design makes it perfect for any office set-up — whether you intend this chair to be placed at home or in an actual office. Its hand-sculpted metallic painted arms add to its overall class and elegance. it also has a matching metallic 5-star base that doesn’t only look elegant but is incredibly durable too. Next on the list of the top 15 most comfortable office chairs is another one coming from La-Z-Boy. 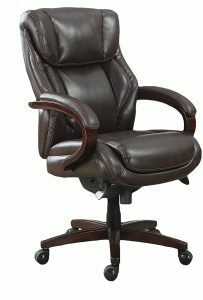 Though much pricier compared to the other office chairs on this list, the La-Z-Boy 45783 Bellamy Executive Bonded Leather Office Chair is definitely worth it. Consider it your reward because of your hard work. Also featuring the ComfortCore Plus with Memory Foam technology, as well as commercial quality strength that guarantees durability to last for years, this chair is definitely a must-have! The comfort that the La-Z-Boy 45783 Bellamy Executive Bonded Leather Office Chair offers is simply undeniable. Aside from ergonomic controls to adjust the chair according to your preference, it features a ComfortCore Plus with Memory Foam advanced layering system. This offers a plusher cushioning but with the right amount of firmness so you can feel the support and the comfort of the office chair. Furthermore, it has layered body pillows and the headrest is padded too for even more comfort. La-Z-Boy is a reliable brand. Many of us own a La-Z-Boy and you must know by now that the chairs made by this manufacturer lasts for years. The La-Z-Boy 45783 Bellamy Executive Bonded Leather Office Chair is made with the highest quality materials. It comes with bonded leather upholstery and wood components for impressive durability even if you use it for endless hours every day. This chair offers commercial quality strength that has passed BIFMA testing standards. The maximum weight limit is at 250 lbs. For your peace of mind, the chair also comes with 10-year limited warranty. Imagine the usual La-Z-Boy that you would see in a living room. Make that a little bit more compact and turn it into an office chair — that’s exactly what the La-Z-Boy 45783 Bellamy Executive Bonded Leather Office Chair looks like. It has classic-styled rich wood arms and has premium wood-finish legs too. The seat edge has a waterfall style to help in circulation of the blood on your legs. The cushions are contoured that doesn’t only make this chair very comfortable; it looks even more luxurious too. The La-Z-Boy 45783 Bellamy Executive Bonded Leather Office Chair is available in coffee brown color. This Serta office chair is classified as a mid-back chair but would certainly pass as an executive chair with its very elegant look. The Serta 44186 Back in Motion Health and Wellness Mid-Back Office Chair is pricier compared to most of the office chairs on this list but with its amazing comfort and exceptional durability, it is definitely worth it. At first glance, you already know that this chair is made for professionals and is simply just classy. With the eco-friendly materials used as well as the ergonomically design it offers, there’s no reason why you wouldn’t consider the Serta 44186 Back in Motion Health and Wellness Mid-Back Office Chair. The Serta 44186 Back in Motion Health and Wellness Mid-Back Office Chair is classified as a health and wellness chair because of its posture-correcting tilt technology. The Back in Motion Active Seating Technology adjusts the chair as you lean forward or backward. It helps increase circulation, promote comfort and relief as well as reduces compression. On a long-term basis, you will feel how the chair minimizes stress and discomfort. Furthermore, it features an elevated and padded headrest, deep-layered body pillows and a contoured adjustable lumbar area. It even allows adjusting of the armrest for a more customized fit. The Serta 44186 Back in Motion Health and Wellness Mid-Back Office Chair has several strength and durability features. Aside from the limited 1-year warranty offer, the Serta 44186 Back in Motion Health and Wellness Mid-Back Office Chair has heavy-duty 60mm caster wheels that are smooth gliding. Its base layer is fortified for added durability. The seat is upholstered with eco-friendly bonded leather with contrast stitching. 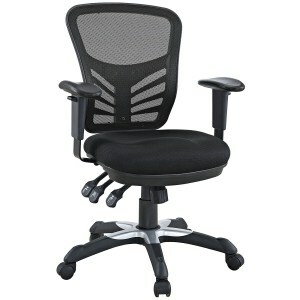 The Serta 44186 Back in Motion Health and Wellness Mid-Back Office Chair is available in black. It is a mid-back style chair with seat dimensions of 20.25 x 16.25 x 26.20 inches. The chair’s height can be adjusted from 38.25 to 40.25 inches. The armrest can be adjusted too from 25.5 inches to 29.25 inches. AmazonBasics might be a generic brand for online shoppers but through the years, its popularity great when it comes to high quality but affordable office supplies and furniture. It offers a wide variety of products and a convenient online shopping experience. Very satisfied owners have rated the AmazonBasics High-Back Executive Chair thousands of times. It has been labeled as a best seller online not out of bias because it comes from the AmazonBasics brand but simply because it is well deserving of all the attention it gets because of the great quality and durability this chair offers. According to many owners who have left their generous comments on the AmazonBasics High-Back Executive Chair, it is indeed a very comfortable chair. It was designed ergonomically and sitting on it for hours every day is a luxury on its own. Having a padded backrest and seat adds to the overall comfort too. Its armrests are padded too. Because they swivel 360 degrees, its wheels are smooth rolling. The chair is pneumatic, which makes height adjustment very simple. It is undeniable that the AmazonBasics High-Back Executive Chair is one of the most comfortable office chairs out there. For its price, you’re truly getting a great deal. The fact that it comes with a 1-year limited warranty is already a good thing as you are protected against manufacturer defects. However, you’ll be happy to know that based on the feedback of owners, the AmazonBasics High-Back Executive Chair is quite a sturdy and durable chair. It is even comparable to more expensive office chairs, considering this is a high-back executive chair that’s expected to be a lot pricier. Furthermore, the AmazonBasics High-Back Executive Chair has a 250-pound maximum weight capacity. Available in black and brown, both very basic yet classy looking colors, the AmazonBasics High-Back Executive Chair is a great addition to any office. It is made with bonded black leather and PVC upholstery for a smooth yet very durable cover. Furthermore, the casters or wheels are made with durable nylon for smooth-rolling mobility and stability. 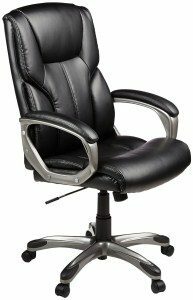 The AmazonBasics High-Back Executive Chair measures 29.13 x 25.59 x 41.34-45.08 inches (L x W x H). Weight capacity at 250 lbs. From mattresses to office chairs and so much more, Serta has consistently remained an industry leader for almost eight decades and counting. Comfort and quality is the brand’s topmost priorities and the Serta Microfiber Executive Office Chair 43670 is a certain proof. It is very stylish and by looking at it alone, you already know how comfortable it is. The best part is that it is very affordable. Best to just follow the instructions that come with it on how to assemble because that will save you several dollars. So if you try assembling it on your own, the Serta Microfiber Executive Office Chair 43670 is a definite bargain! The Serta Microfiber Executive Office Chair 43670 looks very inviting. The only struggle is that you might find it hard to get up after sitting down because of how comfortable it is. It is plush and features layered pillows throughout its backrest for a more relaxing experience. The contoured lumbar support area keeps your lower back relaxed and will help maintain proper posture. The edge of the seat is slightly inclined to lessen the pressure on your legs and to reduce fatigue. Durability is a feature that Serta consistently offers across all their products. The Serta Microfiber Executive Office Chair 43670 is made with microfiber material that’s not only durable but also stain-resistant, dust-proof and very easy to clean. It also features a five-star heavy-duty base that has met and even exceeded the standards of BIFMA testing. The dual wheel casters are also heavy duty and works on different kinds of surfaces. Its maximum weight limit also stays at 250 lbs. This USA-made office chair also comes with a 1 year limited warranty. We couldn’t stress enough how comfortable the Serta Microfiber Executive Office Chair 43670 looks. Because it is plush and the microfiber upholstery looks so smooth, you can’t help but feel it and touch it, and eventually sit on it for a long time. 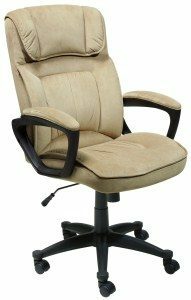 Instead of the usual black or brown, the Serta Microfiber Executive Office Chair 43670 is available in beige and gray, which are also classy and very elegant, not to mention quite unique. 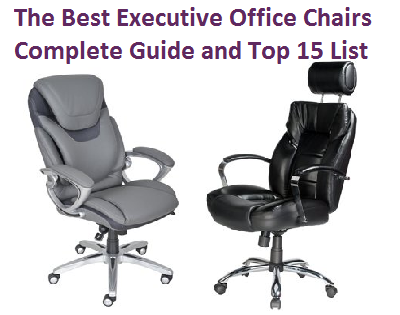 For the purpose of this review, we will be focusing on the Executive Chair only. Because it is extra-large and features a high back, the Genesis Large Executive Office Chair is perfect whether you’re a smaller or larger individual. It offers great lumbar support and is generously padded for utmost comfort throughout the day. The height and back is adjustable too so that you can keep the chair customized at your own preference. 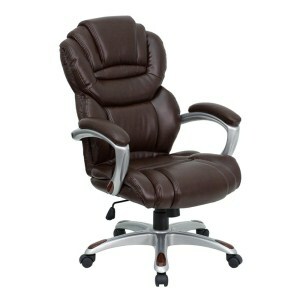 The Genesis Large Executive Office Chair is padded and has a pillow headrest. Its seat has a waterfall design for reduction of pressure and circulation promotion. The materials used on the Genesis Large Executive Office Chair are all very durable and made with excellent workmanship. It is easy to assemble too so you can do it on your own rather than paying a professional to assemble the chair for you. The base is heavy-duty so that it will last for many years to come. The dual wheel casters are incredibly durable too and work well no matter the surface, whether it’s a concrete floor or a carpet. The Genesis Large Executive Office Chair is very stylish. It is cushioned and ergonomically designed to assure style and comfort. It has an adjustable lever that allows you to reposition your office chair at your preference. Its measurements are 29.75 x 24.25 x 44 to 47 inches. The armrests are adjustable too and looks unique compared to other office chairs. These are also padded for added comfort. It is available in black, which makes it a great addition to any office space. An office chair that looks so sleek and classy, you’d definitely want one for your own is the Modway LexMod Jive Highback Office Chair. This style is quite common with a thinner but still comfortable backrest. It is available in several colors, which is great if you want a stylish touch to your office. It is quite pricey but definitely worth it. It is available in high back, armless, and modern models. For the purpose of this review, we are only focusing on the high back model. The Modway LexMod Jive Highback Office Chair is a modern office charge with a ribbed vinyl back and a padded vinyl seat. It is kept simple but comfort is not sacrificed. It comes with a tilt lock for tension control and the height can be adjusted as well. While it doesn’t offer such a plush feeling without the layers of pillows and all, the Modway LexMod Jive Highback Office Chair can still offer enough comfort with the right amount of support and stability. The Modway LexMod Jive Highback Office Chair features five dual-wheel casters, which are all very smooth gliding and durable. Its base is made with chrome-plated aluminum for an overall exceptional durability. The vinyl upholstery used for the Modway LexMod Jive Highback Office Chair is also very durable and should last without problems for many years to come. The Modway LexMod Jive Highback Office Chair looks simply classy and elegant. It is sleek and stylish, fit for the professional executive who needs convenience and comfort while at work. Just like the other Modway office chair ranked on this list, this one has several colors available including black, brown, gray, white, orange, green, red and more. If you want other options, the Modway LexMod Jive Highback Office Chair is also available in Mid-Back and Armless Mid-Back models. The dimensions of the chair are 22 x 28.5 x 42 to 45.5 inches. The seat dimensions are 20 x 18.5 x 17.5 to 20.5 inches. The armrest is 1 inch thick and adjustable from 26 to 29 inches. The cushion of the seat is at 2 inches and the base measures 20.5 x 22 inches. The Modway Articulate Mesh Office Chair is a modern-looking office chair that hasn’t taken away the comfort and elegance of the usual executive chair. It is available in a variety of colors and is simply attractive. It has extra-comfort and convenient features too that will be discussed below. While it is a tad bit pricier compared to other office chairs on this list, you surely won’t be disappointed with what the Modway Articulate Mesh Office Chair can offer. It is simply an office chair that you’d want whether at your place of work or even at home. Modway is a brand known for their contemporary and modern furniture pieces that you’d love to have at home, in your bedroom or even in the office. The Modway Articulate Mesh Office Chair is more than just an attractive looking chair. It has a number of features that you will surely appreciate. Its mesh back makes it breathable and comfortable no matter the weather. The sponge seat is soft yet sturdy enough to give support. It will keep you relaxed but keeps you up and about for continuous work. The back height and the seat depth can both be adjusted. Even the armrests’ heights are adjustable. Furthermore, passive lumbar support is offered to prevent backaches. It even has tilt tension and lock functions that allow you to comfortable recline and incline the chair. Durability is a great feature offered by Modway office chairs. The Modway Articulate Mesh Office Chair is made with high quality materials and workmanship is exceptional. The five-hooded dual caster wheels are stable and sturdy but remains smooth gliding even on carpeted floors. If you want a dash of color in your office floor, the Modway Articulate Mesh Office Chair is the perfect addition. You can either choose one color exclusively or several colors for each department. Colors available include black, blue, brown, gray, green, orange and red. The Modway Articulate Mesh Office Chair looks modern because of the skeletal support that’s visible through the mesh backrest, as well as the three handles underneath the seat that’s available for different functions. The chair measures 21 x 25 x 37 to 30 inches (L x W x H). The padded armrest can be adjusted from 27 to 31 inches. The seat measures 18 x 19 inches. The backrest is at 22 inches and the cushion of the seat is 4 inches thick. It looks like a racecar’s seat. It’s even great as a gaming chair. 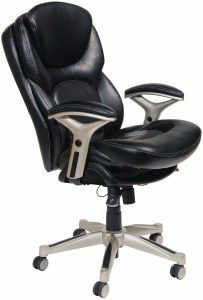 The Best Choice Products Executive Racing Office Chair is one of the more affordable choices on this list but it doesn’t lack when it comes to comfort, durability and style. 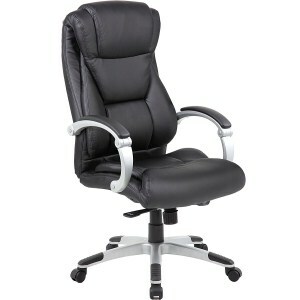 The Best Choice Products Executive Racing Office Chair is great whether you’re using it for your home or your office. The Best Choice Products Executive Racing Office Chair is designed ergonomically so that you can use it for work or for your endless gaming sessions. It comes with impressive padding on the seat, back and its armrests so that you can feel comfortable even while sitting for long hours. The PU leather used as upholstery for this chair adds to its overall comfort too. Highly reviewed by many owners, the Best Choice Products Executive Racing Office Chair proves to be a very durable choice. It is made for use for long hours so expect this office chair to last for many years. The Best Choice Products Executive Racing Office Chair is made with durable PU leather material and steel with impressive workmanship. Its weight limit is at 260 lbs. 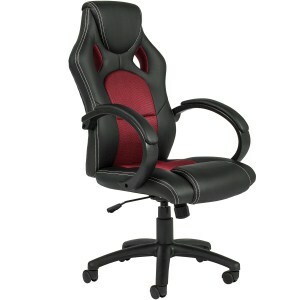 The Best Choice Products Executive Racing Office Chair is available in a combination of red and black. If you prefer other colors, there are similar-looking office chairs from Best Choice that you can choose from. The Best Choice Products Executive Racing Office Chair weighs just 32 lbs. It has padding on its seat, back and armrests. Its adjustable height is from 18 to 21 inches. The seat measures 19.5 x 20 inches and the back is at 20 x 28 inches. The AmazonBasics Big & Tall Executive Chair may be pricier compared to the first AmazonBasics chair features on this list, but we must say that this one is much sleeker, classier and has an overall more elegant look. The AmazonBasics Big & Tall Executive Chair is made especially for bigger and taller individuals. If the usual weight limit for most office chairs is at 250 lbs., this one is set at 350 lbs. The AmazonBasics Big & Tall Executive Chair has an adjustable lumbar mechanism that offers the right amount of lose-back support. For added comfort, it features generously padded curved armrests as well. Sit at your preferred angle with its ergonomic tilt with infinite locking adjustment. It has a pneumatic control handle too to adjust the seat’s height. The AmazonBasics Big & Tall Executive Chair’s bonded leather upholstery, padding and the waterfall-style seat edge adds to its comfort too. Since this office chair is made for bigger and taller individuals, it is made with more durable materials compared to the other office chairs on this list. In fact, commercial-grade components make up the AmazonBasics Big & Tall Executive Chair. It supports up to 350 lbs. of weight compared to the usual 250 lbs. that other office chairs can support. And for your much deserved peace of mind and for protection against manufacturer’s defects, the AmazonBasics Big & Tall Executive Chair comes with an included 1-year limited warranty. 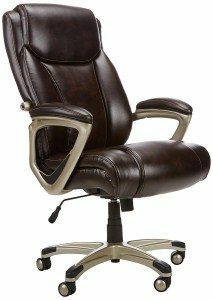 The AmazonBasics Big & Tall Executive Chair is a brown leather office chair. It looks absolutely classy and elegant. Its design is timeless and will definitely never look old or out of style even as you use it for several years. It has a 360-degree swivel feature and the wheel casters are smooth rolling over multiple types of surfaces. The overall measurements of the AmazonBasics Big & Tall Executive Chair are 27.25 x 29.5 x 47 inches. Its height adjusts from 18.75 to 22.5 inches. 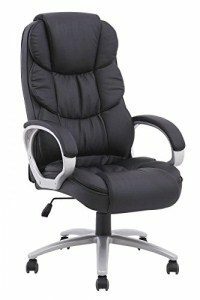 One of the most affordable options on this list of the most comfortable office chairs is the BestOffice Black PU Leather Ergonomic High Back Executive Best Desk Task Office Chair. In fact, it is so affordable you can even get this classy executive chair for each of your office staff without having to mess up your company’s budget. It is very elegant-looking too. Most importantly, the BestOffice Black PU Leather Ergonomic High Back Executive Best Desk Task Office Chair promises durability that will last through years of daily use. The BestOffice Black PU Leather Ergonomic High Back Executive Best Desk Task Office Chair is extremely comfortable. It is made with soft PU leather upholstery and very generous padding. Even the armrests are padded for added comfort. It also features lumbar support that’s best if you intend to use this for hours on end every single day. 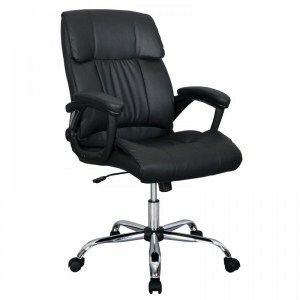 The materials used for the BestOffice Black PU Leather Ergonomic High Back Executive Best Desk Task Office Chair from its upholstery to its arms and base are all very durable and of the highest quality. The chair is oil and water-resistant for easy cleaning and prolonged beauty with very little to no maintenance. This chair has a 250-pound maximum weight capacity. The BestOffice Black PU Leather Ergonomic High Back Executive Best Desk Task Office Chair is a 360-degree swivel chair with very durable caster wheels that roll smoothly even on carpeted surfaces. It features a pneumatic gas lift for easy height adjustment too. Available in black, the BestOffice Black PU Leather Ergonomic High Back Executive Best Desk Task Office Chair is definitely a great piece of furniture to have in your office. The seat size measures 17.7 x 20.5 inches. The backrest is at 21 x 25 inches. Overall dimensions are at 25 x 27 x 41 to 42 inches. 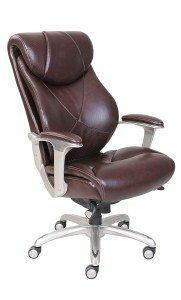 The 2xhome Modern High Back Ribbed PU Leather Tilt Adjustable Office Chair looks very similar to a previous Modway reviewed on this list. The difference, however, aside from the brand and price tag, among other features, is that this one from 2xhome is only available in neutral colors such as white, brown and black. It is fairly priced, in fact one of the more affordable office chairs on this list and it looks absolutely classy and elegant. Its design is modern but it’s a perfect fit no matter the layout and concept of your office. It is highly comfortable too. When it comes to comfort, since this is a high-back chair, although the 2xhome Modern High Back Ribbed PU Leather Tilt Adjustable Office Chair has quite a think backrest, it is still very comfortable and supportive. The PU leather upholstery features rib stitching and the material itself adds to the overall comfort of the chair. Its height and the tilt tension are also adjustable. The armrests are covered too for a more comfortable feel. There’s no upfront warranty offer provided by the manufacturer but you can always call and ask customer support prior to purchasing this chair. The 2xhome Modern High Back Ribbed PU Leather Tilt Adjustable Office Chair, however, is made with very durable legs and arms and the PU leather upholstery used is made with high quality material. The workmanship is impressive too. The upholstery features ribbed stitching for added durability. The support base is made of chrome steel for longer-lasting durability and stability. It features 5 wheel casters that glide smoothly on multiple types of surfaces. The 2xhome Modern High Back Ribbed PU Leather Tilt Adjustable Office Chair is also available in a mid-back model if that’s the office chair type you prefer. For the 2xhome Modern High Back Ribbed PU Leather Tilt Adjustable Office Chair, white and black are the easiest colors to get a hold of; however, you can contact the manufacturer directly if you want to check on the availability of the 2 shades of brown that they offer. The most affordable on this list and among the most affordable in the market today, the BestOffice Black Ergonomic Mesh Computer Office Desk Midback Task Chair is definitely a great choice, especially if you need to purchase multiple chairs for your office. It is not an executive chair, rather it is classified as a mid-back and a task chair — so that places this somewhere in between a low back and a mid-back chair. The back size is at 17 x 20 inches. Despite being a bargain, this chair does not look and feel cheap. In fact, it is durable and many owners would attest through reviews and ratings that it does last for a long time. With a mesh backrest for breathability, arm rests and just the right amount of lumbar support, the BestOffice Black Ergonomic Mesh Computer Office Desk Midback Task Chair is a great choice for daily use. It isn’t exactly the most beautiful office chair you’ll find around as it looks simple and quite “regular”. However, if comfort and functionality are your first and foremost priorities, the BestOffice Black Ergonomic Mesh Computer Office Desk Midback Task Chair seals the deal. Instead of a cheap plastic base, the BestOffice Black Ergonomic Mesh Computer Office Desk Midback Task Chair features a heavy-duty metal base. The back is made of mesh and the seat is covered with mesh fabric as well. It is easy to clean and very simple to maintain. Although there is no outright warranty mentioned by the manufacturer, you can drop them a call to check whether there’s any coverage included. The maximum weight capacity is at 250 lbs. 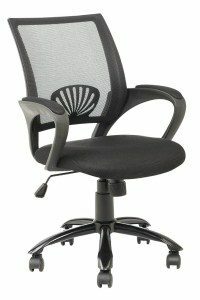 The BestOffice Black Ergonomic Mesh Computer Office Desk Midback Task Chair is very simple. It is exactly how most of us would imagine a regular office chair to be. It is available in black and comes with comfortable armrests. It offers a 360-degree swivel for your convenience. The seat measures 18 x 19 inches. Height is adjustable from 19 to 23 inches. The backrest measures 17 x 20 inches. Another widely reviewed office chair that has received thousands of high ratings is the BestOffice Ergonomic PU Leather High Back Office Chair. It is more affordable compared to many other products on this list. Considering that this is a high back office chair, for its price, the BestOffice Ergonomic PU Leather High Back Office Chair definitely gives you the bang for your buck. It also has a 250-pound weight limit, which makes is as heavy duty as most of the other office chairs you can find on this list. Endure endless hours of working with this sturdy but very durable office chair that will keep you relaxed yet up and energized the entire day. This BestOffice Ergonomic PU Leather High Back Office Chair is super comfortable with upholstered pillows on the back. It is convenient to use too with its 360-degree swivel. The height is adjustable from 19 to 23 inches; whichever is most convenient for you. Its armrests are padded too for added comfort. The body of the BestOffice Ergonomic PU Leather High Back Office Chair is upholstered with sturdy and durable PU leather. Its base is very stable as well and can seat an individual weighing as much as 250 lbs. Furthermore, it is oil and water-resistant and is very easy to clean. The BestOffice Ergonomic PU Leather High Back Office Chair is available in black, brown and white but with different prices. It is quite simple to assemble, as it should come with instructions; however, with a few extra dollars, you can include assembly with your purchase. The BestOffice Ergonomic PU Leather High Back Office Chair has a seat size of 20 x 20 inches and back size of 20 x 28 inches. As mentioned, the seat height can be adjusted from 19 to 23 inches. It looks very unique and from one glance, you already know that the Flash Furniture GO-901-BN-GG High Back Leather Executive Office Chair is extremely comfortable. While it isn’t really on the cheap side, if you happen to find it on sale, then you’re getting a bargain. Because of its lumbar support and ergonomic design, expect a very relaxing time even if you work long hours. The Flash Furniture GO-901-BN-GG High Back Leather Executive Office Chair is a swivel chair that comes with an integrated headrest so that you can relax your neck and head every once in a while. It comes with sculpted seat and back cushions too for extreme comfort. Prevent backaches and keep yourself relaxed, thanks to this office chair’s built-in lumbar support. In fact, many owners have left reviews that this chair might even be way too comfortable as you wouldn’t want to get up anymore after sitting on it for a while. Made with durable materials and with exceptional workmanship in mind, the Flash Furniture GO-901-BN-GG High Back Leather Executive Office Chair is one of the most durable office chairs in the market today. Although there’s no upfront mention of included warranty, you may always request for this information from the manufacturer’s customer support. In addition, owners have left ratings and reviews with information and praises on how durable this chair is. The Flash Furniture GO-901-BN-GG High Back Leather Executive Office Chair is available in plain black or a combination of black and silver. The arms and legs are the ones colored in silver as it is made of steel. The Flash Furniture GO-901-BN-GG High Back Leather Executive Office Chair looks quite unique compared to other office chairs because of the extraordinary sculpting and stitches of the cushions. It measures 27.25 x 29.5 x41 to 44.75 inches.